If you’ve been watching us on the news segments you’re probably wondering if Noah had a super developmental growth spurt. 🙂 Nope…he hasn’t. You’re just getting a 4 month sneak peek. We’re in the process of catching up on Noah’s daily one minute videos; life happens and some days it’s hard to get a video up. So bear with us as we catch up, we’re working on it, I promise. We want you to enjoy every minute so keep coming back to watch this little boy’s story unfold…minute by minute….day by day. It may look mean, but it's all in love. We promise. It’s so much fun watching him try sooooo hard to move forward. You can tell he isn’t interested in staying in one place. He’s ready to move forward…no matter what challenges life may bring his way. We love that about him, and we also love that we can be right by his side to celebrate every win. We can’t wait to see the look on his face when we finally takes that first crawl. It may be hard work, but it’s worth it. We have been working in therapy for several weeks on being in quardraped which is the fancy term for on your hands and knees. We put our leg out and support Noah so that his hands are one side, knees on the other. We put toys in front of him to entertain him, and he’ll reach out trying to grab them. The therapists have also worked with him on rocking back and forth in this position so he can gain balance and stability to one day move forward. I am sure this will be similar to our sitting marathons where his hard work will pay off and Noah WILL move forward and obtain that prize. In the mean time we probably need to start safety-proofing our house. Noah's ready to be mobile. Thank you for all of your recent support and encouragement. We are excited you are part of our journey, and we love hearing about yours. So please keep sharing with us. We really enjoy hearing from you. Has your child started working on any new skills lately? I have told u before that i was a roller to Abby is right noah is one determined little guy. Thank you for continuing on with the blog just as before all the media coverage. This week we’ll take off Andy’s socks and stick some wax paper under his tummy. Helps him move forward instead of pivoting on his tummy. By the way..your parents sound AWESOME! Samantha, five months, just starting rolling over from her tummy to her back. Today my amazing little man is 7 months old! We’ve mostly been working on sitting with support on the floor, crossing his arms over his chest while sitting, putting a roll under his belly to encourage some arm, chest, shoulder strength and overall balance. His legs are quite strong and he pushes against the floor when on his tummy (especially if he’s propped with a roll or boppy). Somtimes he goes forward a bit, or he pivots, or sometimes looks like he’s trying to do the downward dog yoga pose! His core seems pretty strong, he’s almost too strong for himself, physically and socially – this kid is so determined to get what or where he wants that he often winds up in positions he can’t quite get himself out of – I’ll be in troublw when he’s really moving! I see his balance improving every day. Gaining head control was by far, took the longest to achieve. He loves to sit on my legs or on his stool, with my support of course, with his feet on the floor. He loves to go from lying on his back to sitting up…I see him using more of his strength now to do so and me do less of the work. And he knows it!!! He gets this huge grin on his face – and beams with pride! I see that look on Noah’s face in several of his pics as well! This past week my little boy shocked me again… for the past couple of weeks he’s finally at a place where for very short spurts I could hold him around his ribs so he could stand on my lap or the floor. I had to really encourage him to plant his feet and lock his legs. He was unsure of it, and seemed uncomfortable at first. As you might expect, he was wobbly and very quickly fatigued with his legs giving out under him. He would try on his own while sitting pn my lap on the floor occasionally, by locking his legs straight while sitting, but not really getting too far with it. 2 or 3 days ago after changing his diaper I did my usual “Come on Harrison, let’s sit up!” Placed my hands under his arms, he got that game face of concentration on him, he lifted his head off the changing table, and we started sitting up. Then he decided it wasn’t enough for him – he pushed himself up by his heels to a standing position!!!! He beamed with pride. Now, he does this little maneuver after almost every diaper change, and often while placed in a sitting position (moreso when he’s in a “seated in a chair” position, if you know what I mean). He’s even righting himself to better balance – really using the core muscles, even righting his upper body posture – pushing his shoulders back and stretching his arms out! Last night I saw his reposition his feet. 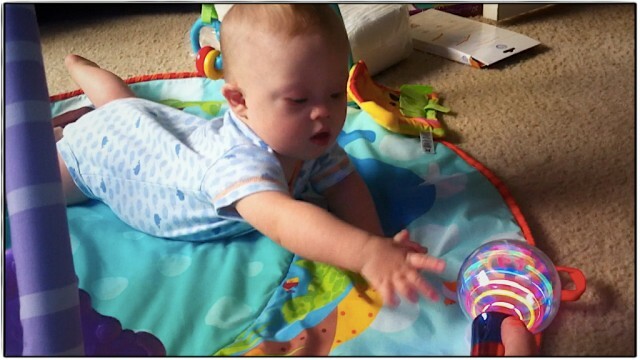 Like you, when we first got Harrison’s dx, we couldn’t imagine what that meant for him or us. Now he amazes me nearly everyday. I know that feeling of seeing your children literally blossom before your eyes. Having a 2 yr old, I feel like we just went through all these milestones! Of course, we’re continuing to be astonished at Jamison’s (2 yr old) advances as well. My husband and I often look at him in awe and ask “when did he learn to to that?” or something similar. He is in that stage where he’s really becoming his own little person – his imagination is exploding, and his ability to process info, empathize with others and understand situations in unreal. It’s a great time to be a parent! Although, they don’t call it terrible twos for nothing, lol! There is one major difference i see in my boys… Harrison has to work sooo hard and has taken so much longer to do things in nearly every aspect; and with Jamison it came soo easy for him. He did everything early – and we just took all those mini=milestones for granted; so it’s been so hard to see Harrison struggle through these milestones. However, I’ve come to really appreciate each step, each mini=goal he achieves. he works so hard! And we are so thrilled each time we hit a big goal :). I will say Harrison has done things sooner than his brother in 2 areas: he is a great sleeper and has been sleeping 8-10 hrs at night since he was a few weeks old – (Jamison was 1 yr. old when he started sleeping the night!) and Harrison does awesome since day 1 of eating from a spoon, which he started 1 month younger than when his brother did! I posted Harrison’s story on one of your posts when Noah was 6 months old, Mostly because you and your wife are very inspirational ans such advocates I am trying to gain insight on anything and everything I can do to help harrison along. So great job Noah – you can do it, because you are doing it! And great job Noah’s Mom and Dad!!! God Bless! I have loved finding your blog, because our boys are so similar in age. At four month older, James is going to knock the socks off his therapists today when he shows them how much forward movement he can make. He’s been scooting for awhile, but would lose interest after a couple of scoots. 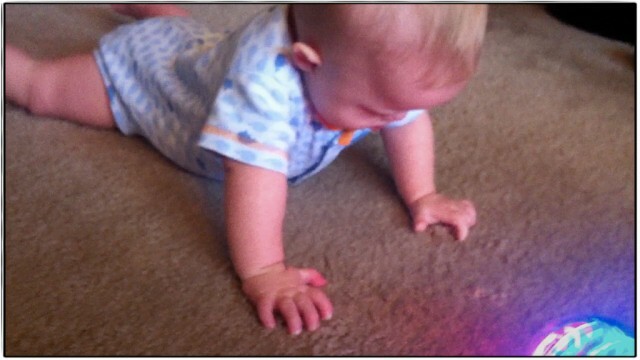 Now he’s crossing the rug to grab his favorite objects (flashy light included!). Needless to say, I can’t wait for this morning’s therapy! Let us know how it went!!!! 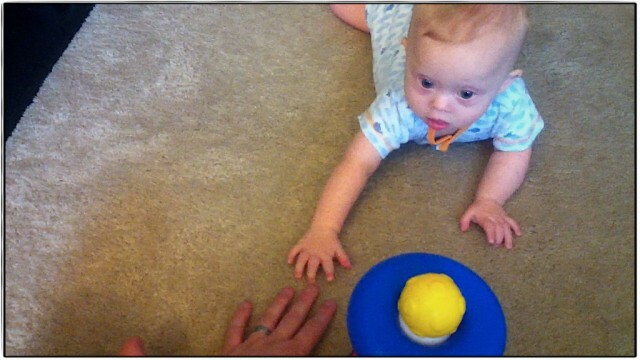 We are always bringing in videos or trying to show off Noah’s new tricks to our therapists. I say that everyday around here 🙂 That is such great news!!!!! Have you seen seeandlearn.org? I keep meaning to print out all of their resources. I absolutely love the down syndrome education international group, they are doing FANTASTIC research about how our kids learn. Flashcards and visual learning is how they start out. Keep up the good work James! No, I hadn’t seen that! I will look into it. I have heard good things about the Signing Time videos, which might be available at your library. We’ve started doing a few signs with James, and it’s cool to see him communicate! I love to remember what it was like when my baby (now 22) was learning all these things. It was alot of work, and we felt mean, but it was worth it! To discouraged Becky from rotating her hips out, we sewed all her pajama legs together and sometimes, we used a piece of velcro to strap her legs together. We used a large tire intertube as a tire swing in the middle of the living room to work on balance (I think). It seemed like a torture chamber at times, but anything they did at therapy, we did at home. It is worth it! To all you parents out there… it is worth it – you are not mean! Keep up the good work! Your house sounds awesome!! We see all the swings and such at our clinic and wonder if we could get that in our house 🙂 What is your Becky up to now? Good luck Noah! You can do it!! Just need to apologize for my ridiculously long rants the last two days on your blog. Very cathartic to tell our story, I guess it was my “therapeutic breakthrough” as many of my fellow clinicians would say ;); but I truly am sorry…. Don’t say sorry! We enjoy reading about everyone’s story. Keep it coming. I remember those days with Suzanne, only she would sit and scream at me for moving the toy away. Her favorite was a rain stick with colored balls. However, our PT told us not to weaken and as a result Suzanne is very strong and runs and climbs better than many kids her age. She also plays baseball and is starting basketball. Go Suzanne!! Noah also enjoys a rain stick that we have. It was actually the first “therapeutic” toy we bought because our OT wanted him to the follow the loud sounds by moving his head side to side. 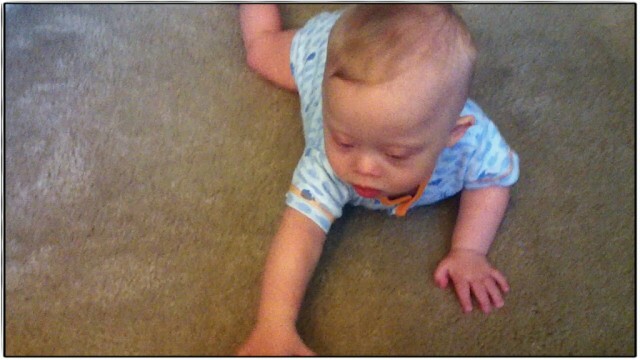 It is so much fun to see Noah crawling. Enzo is almost 8 months and we are so happy to see him just about hold himself up in a sitting position. 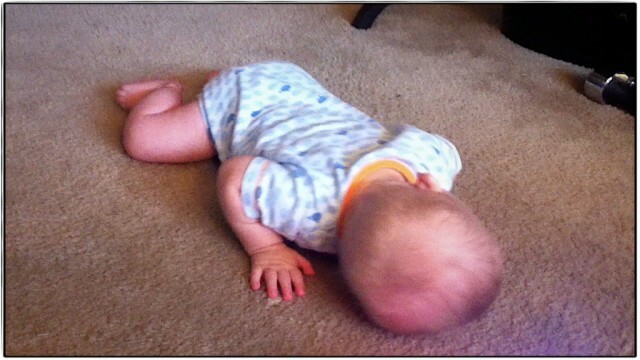 We have also started on the crawling stuff, but now crawling. I know this makes sense to you guys. We are teaching him disassociation with his legs so that he knows he can move them. He is not a fan of being on all fours yet, but we are working on it. He is a mover and a shaker and when he realizes what we are doing, he will be so excited to move move move! Have fun with your visit with Ryan this weekend. Can’t wait to see what happens! God Bless You ALL! I found you through the Nordstrom/Target news. My brother Chris is the youngest of five, he just turned 43! My parent’s were told he probably wouldn’t live past 12, which was the stats back then. So many DS were institutionalized and would not get great health care. He continues to be such a blessing to our family. He works at a sheltered workshop in Alexandria, LA. The city bus picks him up and drops him off each day at my Mom’s home. He is very high level and stays weekends by himself, while my Mom and her husband head to their lakehouse. And a memory! He can replay every minute of the OU football game we took him to, when our youngest was going to school in Norman. Especially getting stuck in a rain storm on the porch of a sorority house. Your journey has just begun my friend and what an advocate your family is! I’m a neighbor of yours in Coppell and have enjoyed seeing you in the news lately. I think what helped her move forward was building her a crawling track. Then gravity helped her down and it kept her from moving backward. That was the first place she ever started army crawling. Of course, now that she’s mobile it’s not as useful, but for the last few months it was great! We have contemplated a crawling track. Did you build one? Leah and Abbie, please fill me in on your opinion on the crawling track. If Noah does end up using one, I can’t wait to see the video and the blog….but since you guys are a bit behind on the videos….just email me and let me know what it is like and whether or not you recommend it…..I”ll probably ask the PT about this too. Thanks so much for all the information ladies! Have a great day! How do I get a picture of Zachary on my little icon box?? Anyone can tell me?? Thanks!! Good work Noah! I love keeping up with Noah’s progress and therapies since Alyson is about a month younger. Looks like we’ve been working on the same things. Alyson’s weakest points are her arms, so she isn’t quite ready to crawl yet. We’ve been working on the being the quad position which she absolutely hates, she would rather be standing and walking. But with that said, two days ago, I noticed that she learned to transfer her toys from her left hand to her right (always in that direction). I am so proud of her! I was actually quite worried that there’d be a big regression in skills since she just came out of a 9 day stay int he hospital. Instead, she showed me (after her out of hospital recovery period) that she actually picked up a couple of new skills. What a trooper!